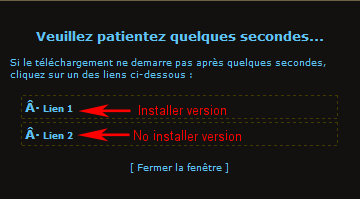 After selecting a file in the download section, scroll down to the bottom of the page then click on "Telecharger ce fichier" (that means "Download this file") button. - in most cases, you will just have "Lien 1" on it. Just wait a few seconds and the download will start automatically. of "Lien 1" will start automatically.